All weekend I was gone on a retreat and I was (am) desperately low on books to read. So low, I read One Quick Bite last week. It was the only vampire book I had left in my book bag - plus it was overdue at the library. 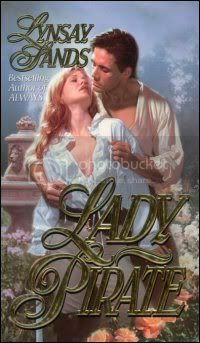 I was hesitant to read it – I didn’t want it to be one of those cheap and trashy romance novels. After all, Lynsay Sands did write these gems: (there are many more where these came from). I was actually pleasantly surprised with this book. It was a quick read, but it was fun too. Yes, it was romantic, but it wasn’t overly trashy. Sands’ take on the origins of vampires is pretty unique. The people of Atlantis were technologically advanced and made nanos that would cure their people of disease and make them genetically superior. These nanos are in the bloodstream and require blood as fuel. Since your body is constantly being damaged by the sun, chemicals, and God knows what else, these nanos have to be fueled semi-often. The oldest vampires are the ones that lived in Atlantis, but new vampires can be made by introducing the nanos into their bloodstream – which is very painful. I thought the book was cute and funny and I will probably give the other one’s in the series a try. 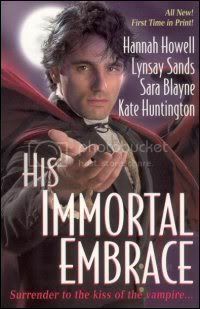 I just started reading Lynsay Sand's vamp books as well, having waited for the same reason you did. I didn't want a trashy romance. I enjoyed her take on the vamps. And I will eventually read the others in the series as well. Thanks for the review. At least I know I'm not alone in my thoughts on it.